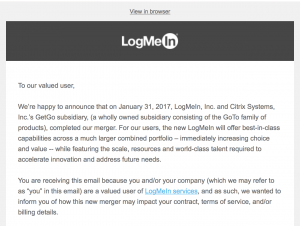 But I don’t have an account with LogMeIn so I ignored it. When I received it again – maybe even a few more times, I thought I better look. That’s when I realized I do have a LogMeIn account. They own LastPass, to which I am a paid subscriber. But I only figured that out by scrolling to the bottom of the email and seeing the logo there. I don’t typically like to out brands for mistakes but this email regarding their merger with Citrix is a classic conversation stopper in a time when we are all trying to make a connection, and engage IN conversation. 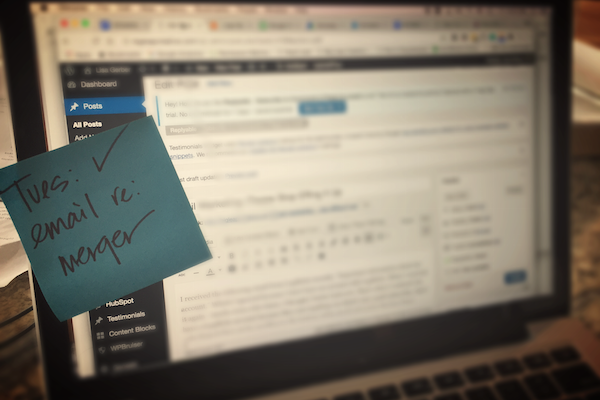 Email is more than a to-do item on the marketer’s checklist – it is for reinforcing relationships. There are a few things I’d do differently in order to get that coveted virtual eye contact with your customers and prospects. I feel like I should go to rehab when you call me a user. You know my name. You know a lot about me. It’s easy enough to address this email to me directly: My name is Lisa. Why not put the LastPass logo in the masthead, and actually segment each of your audiences based on the brands they subscribe to? Meldium, Xively, AppGuru customers…. we’d all get emails from brands we know and like since we, you know, give you money. Again, you have that data. It’s not hard. Be specific and use words that mean something. 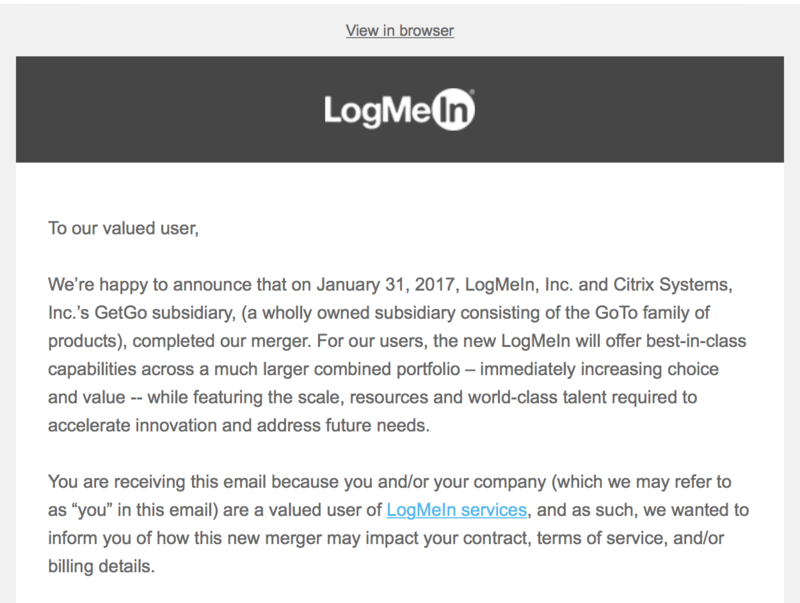 For our users, the new LogMeIn will offer best-in-class capabilities across a much larger combined portfolio – immediately increasing choice and value — while featuring the scale, resources and world-class talent required to accelerate innovation and address future needs. Don’t pretend to care. Actually care. Please note that replies to this email are not monitored – please do not reply to this email. As always, please feel free to contact us here: https://secure.logmein.com/home/support/contact-us. They have someone monitoring the form submissions on the website but can’t give someone access to an email inbox to monitor replies to an email they sent out telling us how awesomely world class they are going to be now that they can scale and innovate and meet future needs? I work with brands daily who struggle to compete for attention and reach their audience and make a connection; to use their narrative to influence action. Why not include a letter from the two CEOs with a vision for the future? Or how two will be better than one? Draw an analogy to something we can all relate to? Provide some context – why does the merger mean anything to us? And if it doesn’t, why not tell us – hey, this merger won’t mean anything to you. The people you want to reach and influence know when you are just checking an item off your to-do list (“Tuesday: email paid subscribers regarding the merger”) or truly using every communication opportunity you have to tell your story, and create meaningful relationships. I work with brands every day who struggle to build audiences and make connections. I hate seeing opportunities like this one squandered. It’s a shame this tool is not present in 90s, my life would be easier then. Nowadays, our job is getting easier because of technology advancement. Young people today are very lucky. They can have several things to do online. Before nothing can be done online, sending messages will take for ages even via airmail.